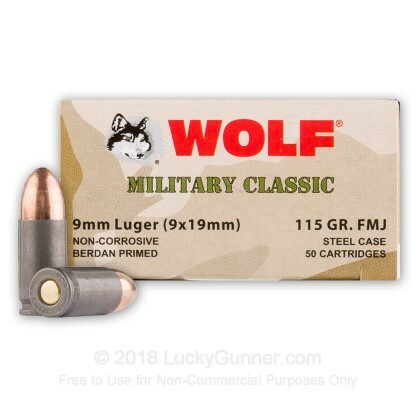 Newly manufactured Wolf WPA Military Classic this steel cased ammunition is rugged manufactured in the hinterlands of Russia. 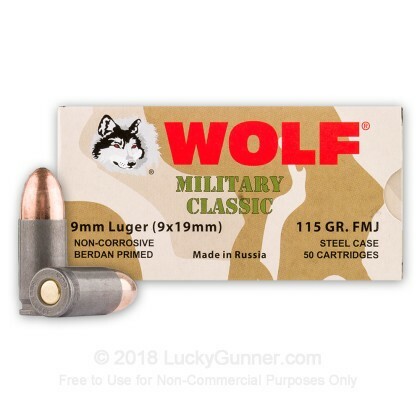 Manufactured in one of Wolf's legendary production facilities in Russia, this product is steel-cased, berdan-primed, non-corrosive, and non-reloadable. I was skeptical about buying this ammo but I gave it a shot (no pun intended). 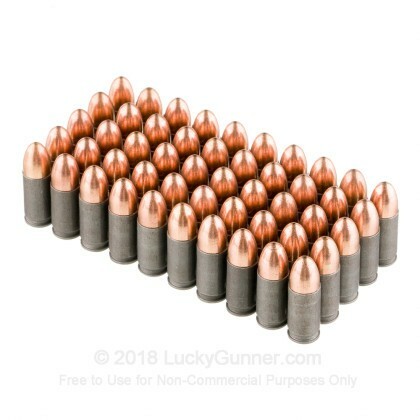 After taking this ammo to the range numerous times I really don’t have any complaints. It does what it is suppose to. It fires fine from my Glock 19. The occasional “dirty” , “sparky”, “smoky” round when firing and after the range I spend a little more time cleaning my gun with this round. I honestly would prefer brass casings but the price difference can definitely persuade your budget. This is perfect for use at any range. I tested this ammo with a Beretta 92FS and PX4 Compact. Quality and Perfomance of this ammo was on par with Tula as far as low cost steel training ammo is concerned. Accuracy was acceptable. No malfunctions or jams. Coating on steel was nice and effective, and packaging was small and efficient. Value is interesting in that this ammo was more expensive than Tula by a small margin. Obviously pricing can change over time but, something to note. 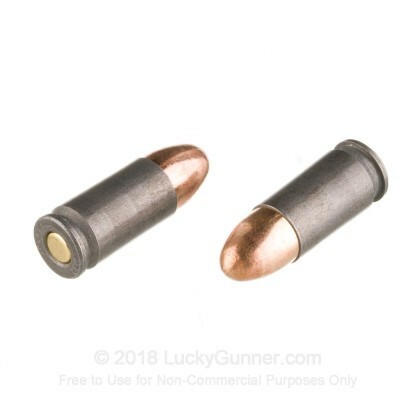 It's good range and training ammo for people who don't reload and can use steel ammo. However it isn't the absolute cheapest as of the time of this review. I've fired 200 rounds through a highpoint 9mm carbine without a single problem. First this review is about the ammo not lucky gunner ! I have tried this ammo through 2 different hand guns . First an Hk P30 V3 I couldn't get one mag through the gun nothing but double feeds and stove pipes. Then a HK P30L LEM trigger same exact problems. This ammo might work well in other guns but HK shooters should stay away. PT 1911 eats this stuff like a fat kid eats cake. Great price and never had a single malfunction. Shot a couple of hundred rounds through my SCCY CPX-2 with only one misfire. Decent ammo to get used to firing the gun, but I wouldn't use it for anything serious. I have found LuckyGunner to be one of the Best Companies I have ever delt with! Not only with the products sold , but with the personal attention they give the customer. I used 200 rounds on my Springfield XD. The steel casing made it a little difficult to load the magazine. Gun jammed 3x. I prefer the brass casings. No jams. Bought the 500 round bulk. I've been through about 200+ rounds with zero problems thus far with my Glock 19. If you're looking for good cost effective range ammo, this is the ticket. Thanks LG for super fast shipping and great prices! You guys rock! Not bad for the price. I go to the range at least once a month. Shot 200rds of WPA with my glock 19 and had 3 miss fires. I fired several hundred rounds of this ammo through my SW9VE (Sigma 9mm) and it all worked flawlessly. The product was sound- but as with a lot of other Berdan primed ammo, which tends to be Russian like TULAMMO, I found these to be just a little dirty. Not smokey but there is a good amount of film on gun. Nothing that won't clean up and if you clean your sidearm you won't have problems. TULA is the cheapest out there, I think these fire the same. I used these with my glock. After i loaded them and was about to pull the trigger my glock melted in the sun...ill buy a Beretta. Perfect for the 9mm auto handgun. JUST USED 250 ROUNDS IN MY WALTHER PPS WORKED LIKE A CHARM.,NO JAMS OR MISS FIRES. 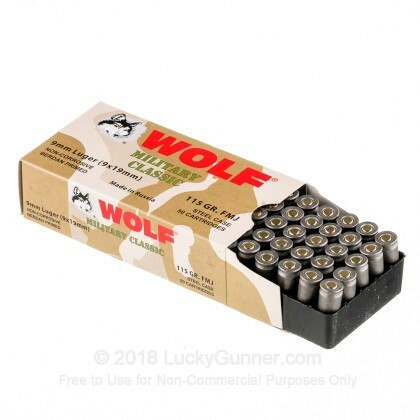 I've shot LOTS (thousands of rounds) of Wolf, including this stuff, through my Glock 19, No jams, no FTF, no FTE. 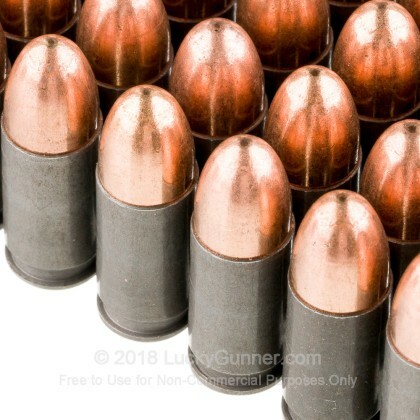 If you have a problem with this ammo, it's because your gun is crap. Buy a Glock and quit your whining. Bought 500 rounds because of price. Cartridges continuously jam in the mags of my Beretta PX4. Doesn't matter how cheap ammo is if it won't come out! My Beretta 92FS eats this without any issues. Also put 30 rounds through my uzi with no hiccups. Good value for the price in my opinion but apparently it doesn't work in some weapons. Price wise this is a great deal however there are too many downfalls. Steel cartridges are extremely hard to load into a magazine. There is just too much friction with steel on steel. I had several problems with rounds jamming in the chamber and several misfires. I originally purchased 1000 rounds; I shall not repeat that mistake. Had a cartridge jam on about every third shot. Never use this ammo again.